Poet Donald Illich‘s poetry has been published in Fourteen Hills, The Iowa Review, and New Zoo Poetry Review. His work will be published in future issues of the Roanoke Review, Passages North, The Innisfree Poetry Journal, Pinyon, Hubbub, Cold Mountain Review, Naked Knuckle, Cross Connect Magazine, and The Sulphur River Literary Review. 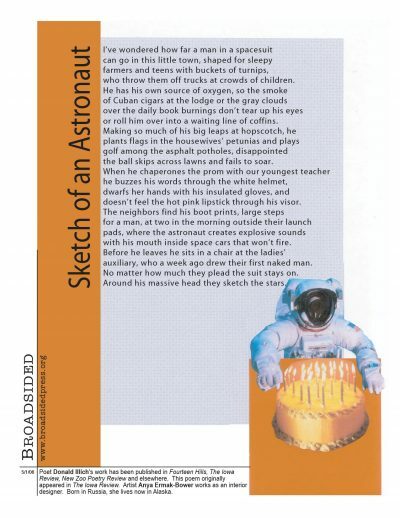 “Sketch of an Astronaut” originally appeared in The Iowa Review. Artist Anya Eramk-Bower earned her design degree from a university in Western Russia. She has lived in Alaska for five years, and channels her creativity into work, cooking, and raising her sons. She is now living in Japan with her family. (full bio).